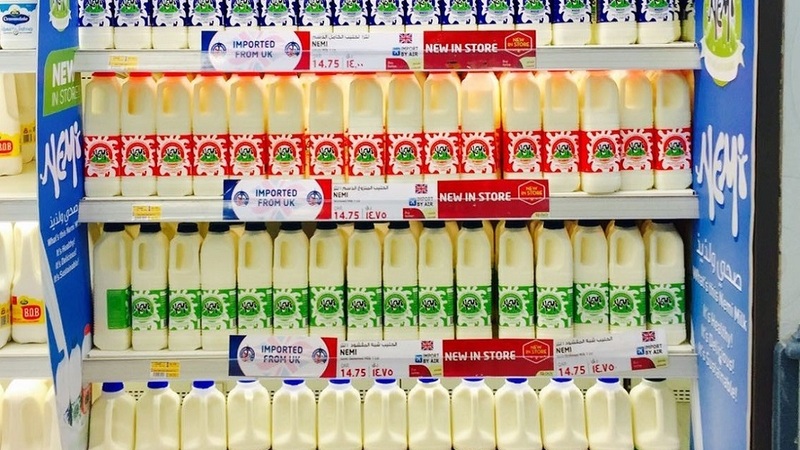 A Cheshire-based dairy is celebrating after becoming one of a select few brands exporting fresh British milk to the Middle East. Family-run Nemi Dairy now has its products on the shelves of six hypermarkets after it was approached by Y International - the UK export arm of Lulu Group International. The milk is pasteurised at the dairy before being transported in chilled vehicles to a temperature-controlled warehouse in Birmingham. Each bottle is then re-packaged with an Arabic label and palletised using special insulating material. It arrives at the airport on chilled vehicles and is air-freighted directly into the region’s central warehouse. Fresh Nemi #milk on the shelves in @luluhypr in the Middle East! This is incredible to see! Andrew Henderson, managing director, said: ­“It is incredible to think that our farmers are milking their cows and then days later that milk in on the shelves in the Middle East. Lulu Hypermarket chain is the largest of its kind in the Middle East. Currently, Lulu operates 134 stores and 14 malls throughout UAE, Qatar, Oman, Saudi Arabia, Kuwait, Bahrain, India and, more recently, Malaysia. Adnan Ahmed, a senior buyer said: “It is great to work with a company that is so passionate about their products. So far, we have received good feedback from our store managers over in Qatar and we will be running in-store tastings over the coming few weeks.